Swakopmund in Namibia is popular with holidaymakers who enjoy its fresh air and beaches. But for me the highlight is venturing into the dunes of the Dorob National Park just outside town with Tommy Collard of Tommy’s Living Desert Tours for a half-day voyage of discovery that’s educational and loads of fun. 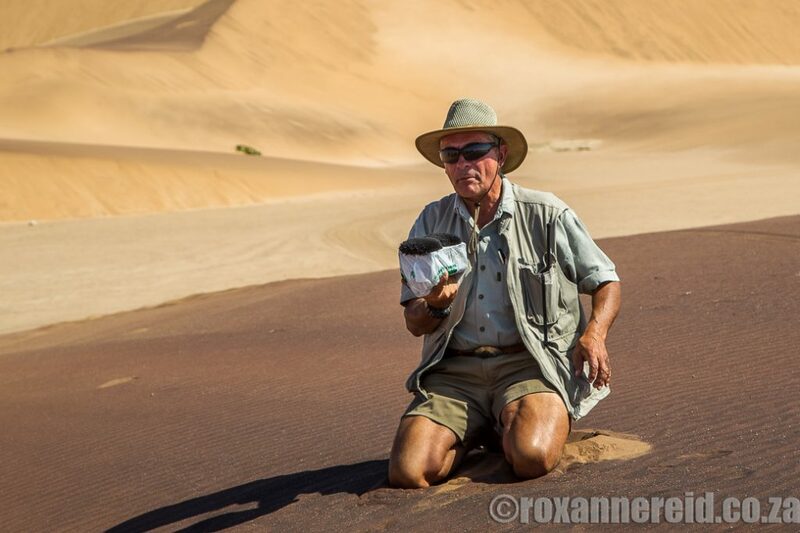 Here in the Namib Desert life is defined by lack of water – just 3-15mm of rain a year – and by overwhelming heat, where sand surface temperature can reach 75C (167F). Luckily, the Atlantic Ocean supplies moisture in the form of fog that can reach 140 km inland. This fog is the heartbeat of the Namib and directly or indirectly benefits all living things, which have adapted in ingenious ways to survive. This is the fastest chameleon on earth, though with chameleons that’s a relative term. It flattens its body to reduce the surface area exposed to the sun, turns light-coloured to reflect the heat and will climb into a bush to get away from the hot sand. It lays eggs in holes dug into hard sand on gravel plains between the dunes. If you drive over the eggs, the sand is compacted and becomes so hard the babies can’t dig themselves out and will die. Conserve this species, which is on the CITES list of endangered animals, by not creating new tracks. 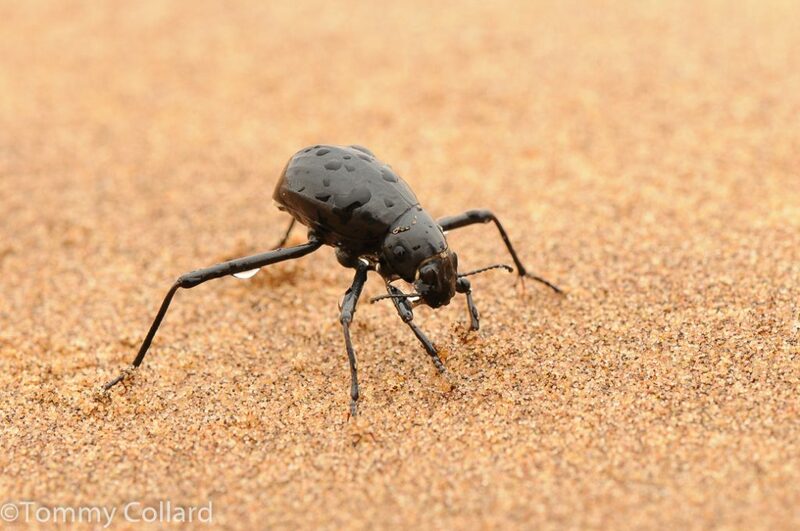 There are thousands of beetle species in the Namib, more than 800 of them Tenebrionids, which have fused wings and can’t fly. When there’s thick fog, these beetles stand at the top of the dune, butts in the air, so moisture can condense on their bodies and run down into their mouths. They can drink 40% of their body weight in water in just one morning, becoming mobile water bottles for other species like chameleons. 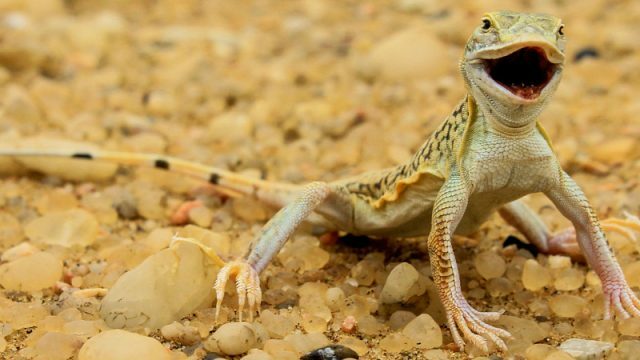 To prevent their feet from burning this clever lizard does a ‘thermal dance’ on the hot sand, lifting one front leg and the opposite hind leg in rotation. If it’s still too hot it runs up and over the dune to the wind side where temperatures are cooler, or burrows to find cooler sand below the surface. It has two bladders. In the second, it can carry 12% of its body weight in water and survive on it for weeks. Most of its moisture comes from drinking fog off its body or stones. This snake has eyes on the top of its head and burrows into the sand with just the eyes showing to watch for a tasty lizard or gecko to gobble. 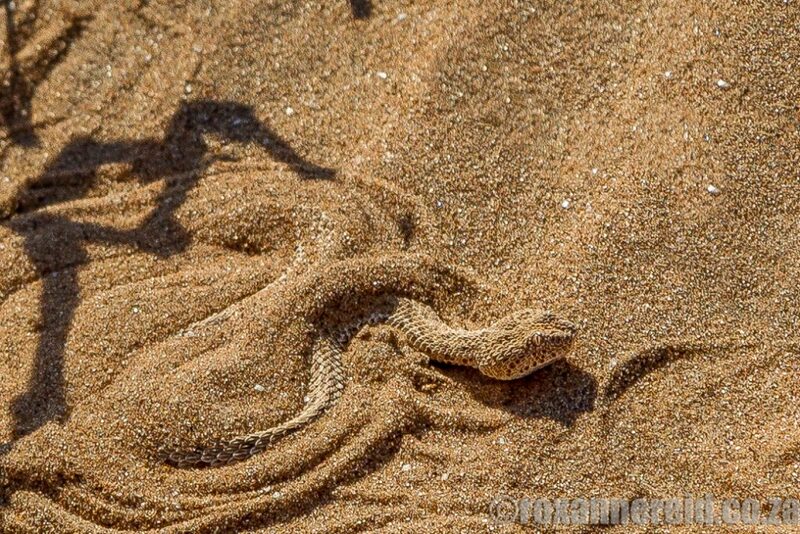 It’s also called a sidewinder after its side-winding motion, which allows it to climb the steep sides of dunes easily. This makes it well-adapted to hot sand because only about half its body touches the sand at any one time when it moves. 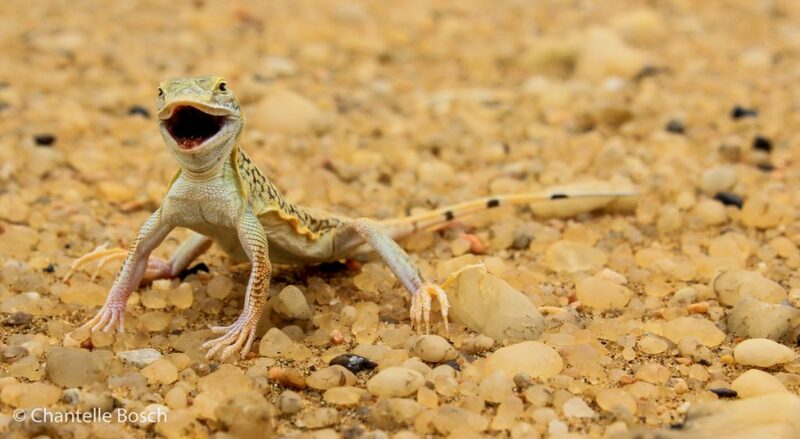 This pretty little gecko can’t blink so wipes sand from its eyes with its tongue. It licks water that has condensed on its body from the fog. By sunrise it uses its webbed feet as shovels to burrow into the sand to avoid high surface temperatures. The webbed feet also help it run fast on soft sand. 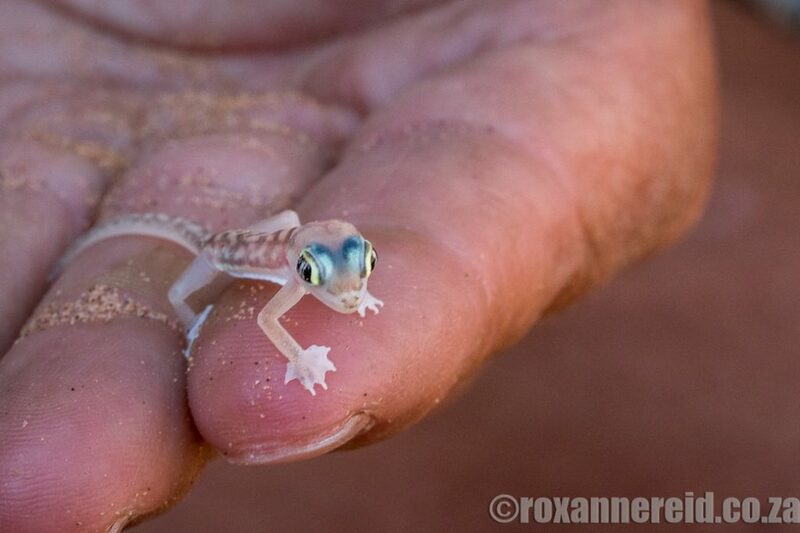 Its skin is soft and sensitive but not elastic so it can’t expand as the gecko grows. Instead, it grows a new skin under the old skin then sheds the old one, even the corneas of the eyes. This legless lizard is blind and, like all lizards, smells with its tongue. Its scales are super smooth so it feels polished to the touch. This allows it to ‘swim’ easily just below the surface of loose sand on the dunes. It’s active in the cooler hours of the day and at night when it feeds mainly on beetle larvae – a good source of water – small insects and spiders. Fat is stored in its tail; if a female loses her tail – which will grow back in 5-6 weeks – she’ll lay fewer eggs but they’ll be larger. 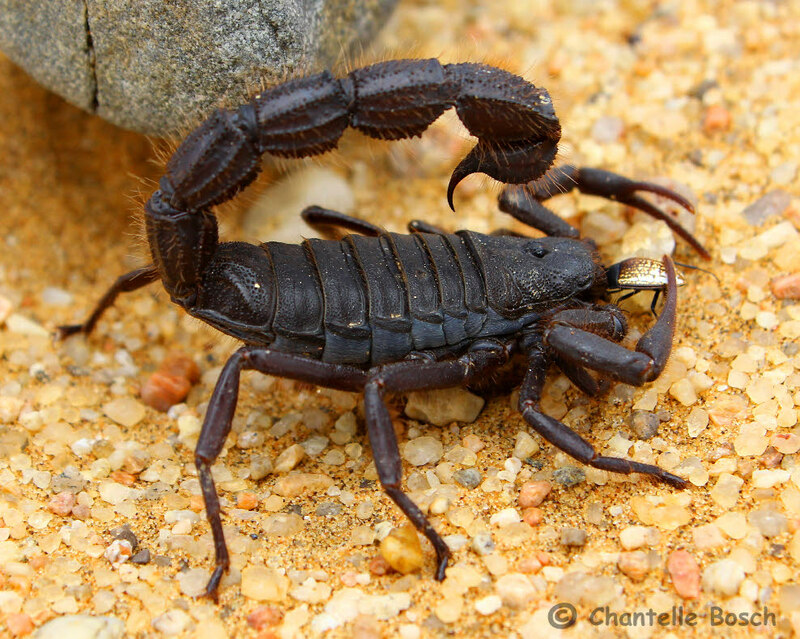 This scorpion can spray its deadly venom and there’s no known anti-venom. It often takes cover among plants to regulate its body temperature, and gets moisture from eating lizards, other scorpions, baby chameleons, spiders and insects. When mating, the male attaches himself to the female with his pincers then deposits spermatophores on a rock, stone or branch and drags her over them for fertilisation. 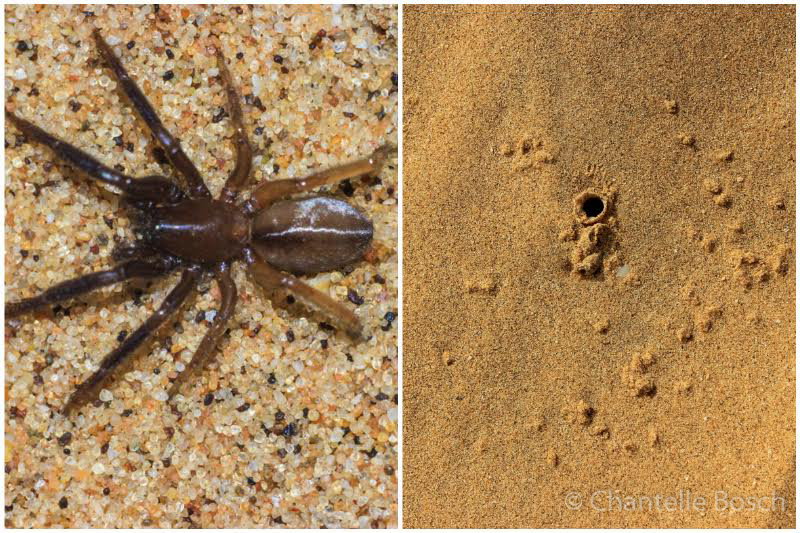 It’s one of few creatures of the Namib dunes that care for their offspring instead of just laying eggs and disappearing. Tube-dwelling spiders have six eyes instead of eight and the first three pairs of legs face forward instead of just two like most spiders. They spend most of their lives in their tube-shaped retreat in the sand, made from strong silky thread. The tunnel goes at least 30cm deep where the sand is cooler. Some species of tube spiders put four quartz stones around the tunnel entrance. Others shoot small balls made of silk and quartz out of the entrance. Each ball is connected with a fine strand of spider web that acts as a trip wire. The spider waits inside the tube, front legs projecting slightly to feel the vibrations and know where the prey is. This round-leafed succulent grows only in the fog belt up to 140km inland and is a source of moisture and cooling shade for small creatures. It’s also food for gerbils, beetles, ostriches, jackal, hyena, springbuck, klipspringer and oryx. 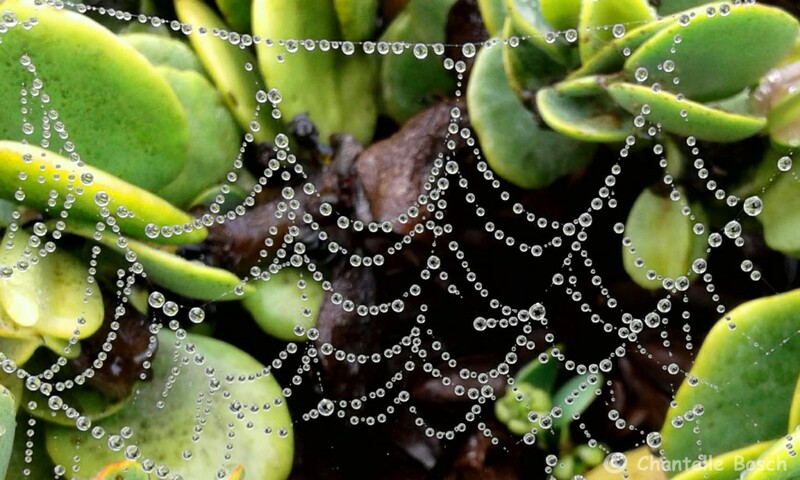 In this photo fog droplets have collected on a spider’s web in a dollar bush. Some 90% of the composition of these dunes is quartz, the rest being minerals like mica and feldspar. Magnetite shows up as black lines on the sand, which Tommy sucked up and collected with a magnet – much to the fascination of the kids in our party. It’s soft and almost furry to the touch. It’s used in pottery, paint, concrete, steel, water purification, etc, but mining it is illegal in Namibia. For the past 16 years Roxanne Reid has worked as a freelance book editor, health and travel writer. She and her husband Keith have driven enough road trip kilometres in Africa to take them around the world about 15 times. She loves everything about Africa – its small towns and villages, its people, its culture and heritage, its wildlife and conservation. She’s happiest in the middle of nowhere, meeting the locals, trying something new, or simply watching the grass grow. Roxanne is the author of two travel books: A Walk in the Park (2015) and Travels in the Kalahari (2012) and shares her adventures on her African travel blog, http://www.roxannereid.co.za/blog.